Hey, you like ice cream, doncha? And you like toppings on your ice cream right? Sure you do – whether they be jimmies or sprinkles these little extras add crunch and texture to ice cream dishes. But wouldn’t those toppings be better mixed in with the ice cream? 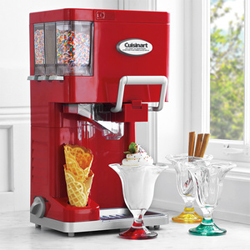 The Cuisinart Mix It In Soft-Serve Ice Cream Maker is specifically designed to add to the ice cream experience. The 1.5-quart capacity maker is capable of creating soft ice cream, yogurt, sorbet or sherbet. When ready, up to three toppings can be selected to dispense along with the ice cream. The end result is a delicious frozen treat, with toppings throughout.